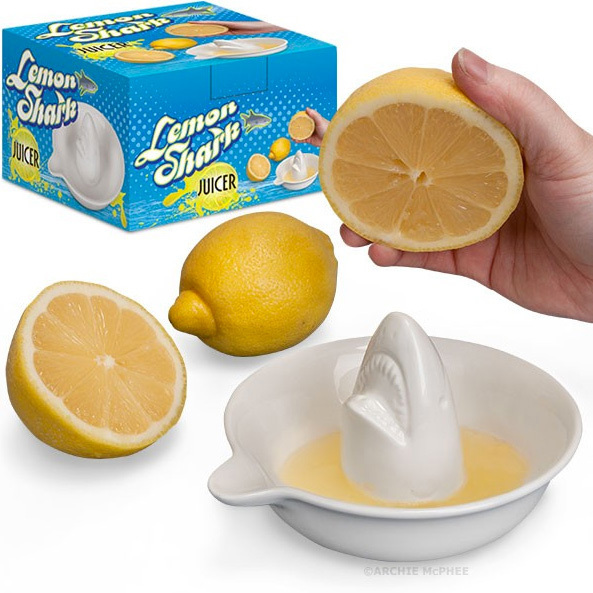 The Lemon Shark Juicer by Archie McPhee is a porcelain juicer that ‘bites’ the juice out of citrus fruit with its shark head. The Lemon Shark Juicer got its name from juicing lemons, but there is an actual lemon shark. When you see an actual lemon shark underwater, its skin looks yellow and pitted like a lemon. The Lemon Shark juicer is a beautiful white porcelain shark on a 5-1/4″ porcelain dish, perfectly placed to squeeze the juice out of lemons and other citrusy fruit.